| Help Guide for Creators | What is S-Log? S-Log is a gamma curve that is optimized under the assumption that grading will be performed in the post-production process. S-Gamut is color reproduction that is supposed to be used together with S-Log. When using S-Log to shoot, performing grading in the post-production process will allow you to create image effects matching each scene with a great degree of flexibility. To make such effects possible, images must be shot with a wide dynamic range and wide color reproduction range. The S-Log gamma curve and the S-Gamut color reproduction are used for shooting such images. Images recorded using S-Log and S-Gamut can be enhanced with detailed image effects during the post-production process. You can create a variety of effects such as fresh morning scenes, scenes with tension, scenes that recall the past, and many more. These effects are finalized during the post-production process. When you shoot images using S-Log gamma, select among the PP7, PP8, and PP9 presets for shooting. To perform grading on images recorded using S-Log, dedicated grading software or video editing software with a grading function is required. You can also try performing basic grading work using Catalyst Browse from Sony Creative Software at the following URL: http://www.sonycreativesoftware.com/catalystbrowse. [ITU709(800%)] is a gamma curve for easily previewing a level of gradation equivalent to that of an image recorded using [S-Log2] or [S-Log3] and graded to ITU709. 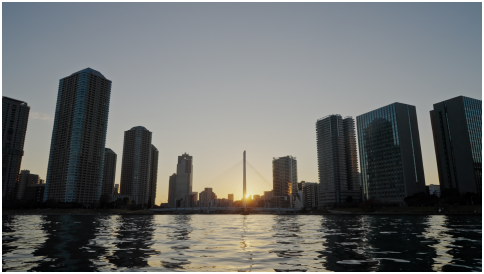 When you adjust the shooting exposure with [Gamma] set to [S-Log2] and then switch [Gamma] to [ITU709(800%)], a low-contrast image will be displayed with ITU709 contrast applied. Although [ITU709(800%)] applies a greater degree of contrast than the S-Log gamma curve, gradations in high-luminance areas may become invisible. Use [S-Log2], [S-Log3], or [ITU709(800%)] depending on the element you want to preview. With S-Log gamma, images are displayed in lower-than-normal contrast during shooting, making them difficult to monitor. The [Gamma Disp. Assist] function reproduces contrast equivalent to that of normal movies on the monitor or viewfinder. This function enables precise camerawork such as confirming or focusing on a subject. The [Gamma Disp. Assist] function reproduces contrast equivalent to [ITU709 Matrix]/[ITU709 (800%)] to display images with [S-Gamut] (color mode)/[S-Log2] (gamma) or [S-Gamut3.Cine]/[S-Log3] on the monitor or viewfinder.